Last month Margaret enjoyed a visit to her cousins’ home in Durban. 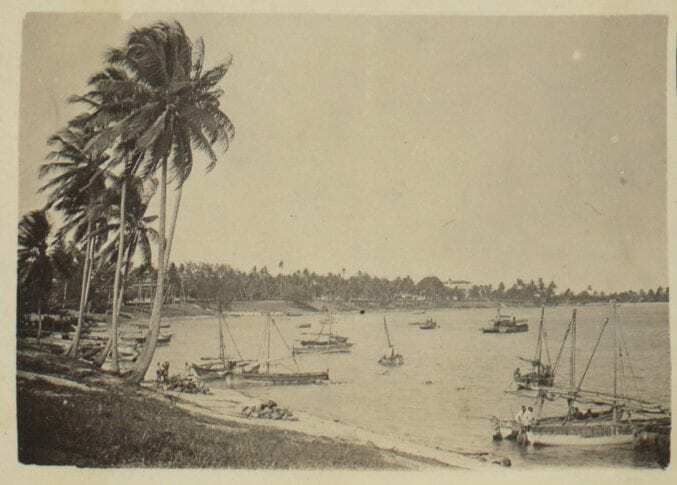 Her next port of call is Dar es Salaam, fairly recently captured from the Germans by British forces. Here we are in D.S.M. where the mosquitos come alongside in a motor launch wearing football blazers, and scramble up the gangway eager for the fray. Thus I quote the Third Mate with his tall stories. He has plaited me a very pretty green bead bracelet and came along yesterday morning to see me wear it, but I was too excited over seeing Sgt Jim White from St Andrews that I’d forgotten all about it. I must wear it all today and be sweet to the “3rd” though, I won’t have the Sergt after we get out to sea again! We got in here on Friday, anchored a few hundred yards from shore and could see the people walking up and down, knew there were hundreds of British boys on shore, and we weren’t allowed to go. No ladies, only men. We threatened to swim ashore, we threatened to dress as men, I was promised several suits of clothing and the men thought it a great joke. I had sent the note ashore and yesterday morning hoped for my visitor’s arrival. Sure enough my Sergeant appeared on shore and looked around, I knew him at once although we had never known one another intimately in the Old Grey City, and he knew me. He was absolutely shaking with excitement, has been out in this place for nearly two years and had never spoken to a Civilian Britisher in that time except an occasional nurse, and only Officers are really allowed to speak to them. We had a lovely forenoon talking together here, the others were all anxious for introductions and asked if any of their friends were anywhere near. He had got a holiday for all day, the first he had had, so Eleanor and Sparks joined us and we four went ashore at 11.30, oh joy, permits had been granted at last. So we stepped upon captured German soil, the first Civilian ladies to enter the Capital since its capture and occupation. Many Germans still live there, but strictly under British Martial law, and the thousands of Soldiers there looked and gazed and envied such of their number who had visitors from home. Jim found out for Eleanor that her friend from Cambridge office is in hospital so we went off to get a permit to see him. I asked him about Potts of Carlisle and he said he was in the Office and a friend of his own. Oh luck! Off we went and saw Potts, I knew his brother much better than him, but we were discussing old days and mutual acquaintances in a few minutes. He gave me some photos of the town and bay, it is really a pretty place and the photos all go towards my “African Tour” collection. We next went shopping in the bazaars buying a few things we wanted on board, and with the assistance of Sergeant Jim and his knowledge of the native language. We had mangos at lunchtime ashore yesterday, giving Sparks the duty of cutting one up for us. Mr Jessop and Mr Berrett do tease me terribly about having someone in every port, and of course they sat opposite the Sergt and me at table last night as that is their usual seat, Eleanor had given up hers to my friend. Ours was a somewhat noisy and also a very jolly dinner table. 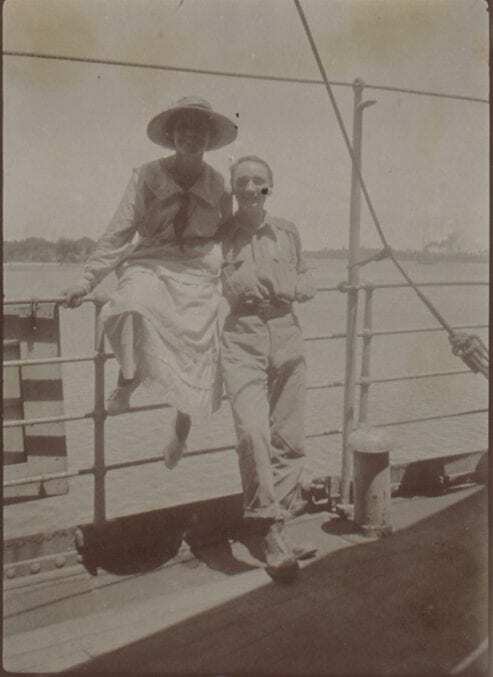 There are two Hospital ships here, also a few “Tramps” and many native boats and Arab dhows in abundance. So we lie peacefully in the bay where our warships, not many months ago, bombarded and captured the port and Capital of what was then German East Africa. 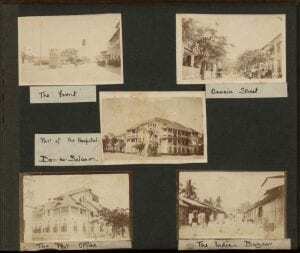 In next month’s instalment, Margaret describes more “days of dreamy delight” in Dar es Salaam as she deepens her friendship with Sgt Jim White. German East Africa was a colony which encompassed present-day Tanzania (excluding Zanzibar), Rwanda and Burundi. Dar es Salaam (Arabic for “Home of Peace”) was its capital. The East African Campaign of WW1, a series of battles between rival colonial powers which took place in their territories, began in summer 1914 and continued for most of the war. 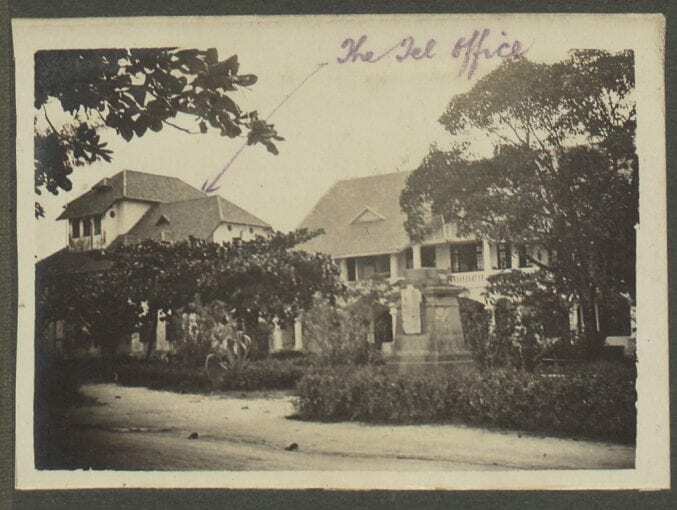 Dar es Salaam fell to the British in September 1916: whether Margaret and friends were indeed the first civilian ladies to set foot there afterwards has not been proved!